This impressive add-on integrates a secure payment gateway Moneris with CS-Cart. This allows you greater control over the checkout experience so that you can test and implement the most effective experience for your store. This extension brings quality service and processing to your CS-Cart store for US and Canada. It is the reliable payment solution and monitor transactions in real time. This payment gateway accept credit and debit cards for payment on your store. Accept payments in Canadian and US dollars. Easy access to online transaction reporting. Canadian merchants can accept payments via Interac (no subscriptions / pre-orders support). User friendly interface to receive online payments. Provides fully secure payment to handle risk management system. After downloading CS-Cart Moneris Payment Gateway, you will get a zip file and install.txt . Read the install.txt carefully and configure it accordingly. Go to “Manage add-ons”, click on “+” to upload and install the zip file as shown below. Go to “Administration” tab and click on “Payment methods”. Click on “+” to create a new payment method. Set the name of the payment method. For checkout choose the processor as “Moneris Payment”. Select template as “cc_outside.tpl” from the dropdown. Configure the tabs accordingly as shown below in the snapshot. 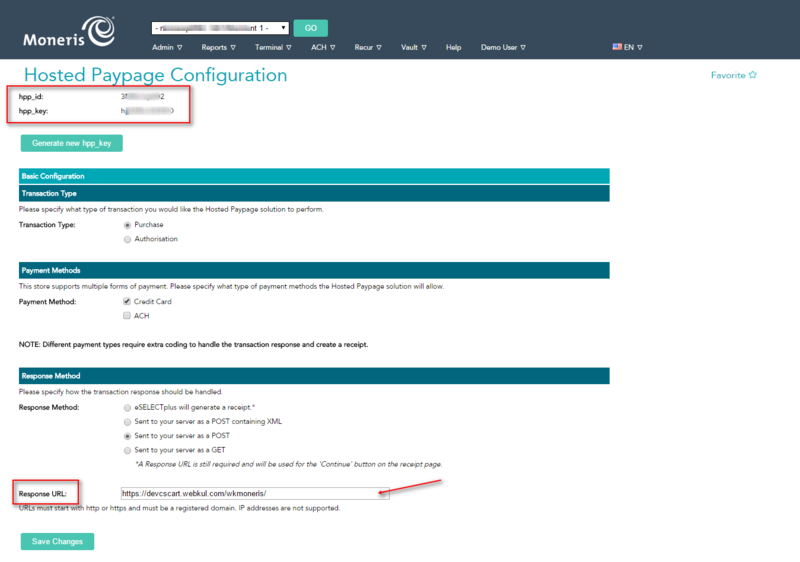 Click on “Configure” and set the parameters as shown below in the snapshot. Enter credentials for Moneris Payment Gateway. Moneris has a different API server for both Canadian merchants and US merchants; select the appropriate country for your merchant account. Write down the name of company which will be displayed on the payment form. 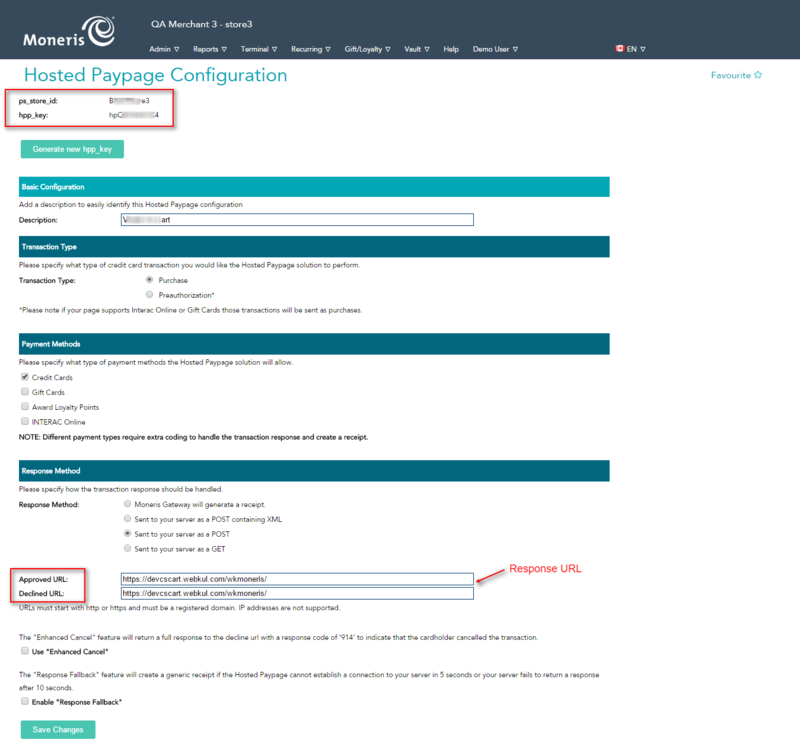 To get Hpp ID and Hpp key, navigate to Admin -> Hosted Config in your Moneris account (for Canadian Merchant) and click the Generate a New Configuration button as shown below. Once the data is generated, use hpp_id and hpp_key to set up the payment method in the store. 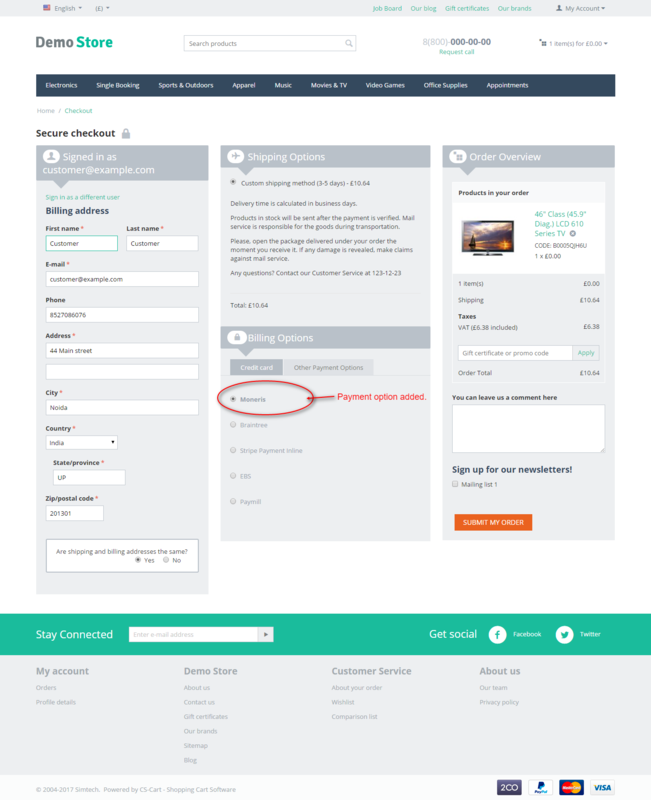 You’ll also need to fill in the Approved /Declined URL (Respose URL in case of US ) field shown in the screenshot above. This should be done for correct processing of transactions. The service will perform a redirect to the specified URL. Note If you have multiple URLs (for example, URL of the main and test sites), you need to get Hpp ID and Hpp key for each site. Now option for payment via Moneris is available for customers at front end. For payment customer need to select the option Moneris Payment as shown below in the snapshot and enter the necessary details for payment. This is all about CS-Cart Moneris Payment Gateway. Still have any issue, feel free to contact us at http://webkul.uvdesk.com and let us know your views to make the module better.